Alzheimer’s Society is the leading support and research charity for people with dementia, their families and carers. There are 750,000 people with dementia in the UK with numbers set to rise to one million by 2021. 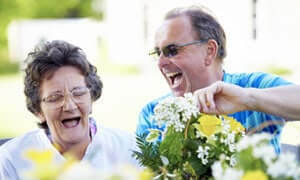 Alzheimer’s Society is a membership organisation, which works to improve the quality of life of people affected by dementia in England, Wales and Northern Ireland. Many of our 25,000 members have personal experience of dementia, as carers, health professionals or people with dementia themselves, and their experiences help to inform our work. The Society’s fight for a better world for people with all types of dementia takes a wide range of forms. Through our network of local services, we touch the lives of over 30,000 people every week, providing practical services and support for people with dementia and their carers. Every year, more than a million people make use of the information we provide. Through campaigning and lobbying we strive to influence government policies and raise awareness of the challenges faced by people with dementia and the people who care for them. And through our research programme we work to improve the knowledge we have about dementia and its treatment – and pursuing the ultimate goal of finding a cure. Giveacar and its donors are proud supporters Alzheimer’s Society as they work hard to support people with dementia all over the UK. If you’re planning to scrap or sell your car, give a car instead to help Alzheimer’s Society in their mission to finding a cure for dementia. Do a good deed and help Alzheimer’s Society continue the work they do when you donate your car to charity.